One of the most popular topics readers of The Barn Blog ask me about is our elopement collection. I think a lot of our couples and readers are torn on whether or not eloping is a good idea, and sometimes even if they truly want to elope, they end up having a "real" wedding and reception instead. Eloping is definitely not for everyone, but there are a few reasons you may want to consider eloping! Many people think elopements are only for pregnant brides or couples that have been in previous marriages. That is so not the case, y'all! Elopements are romantic, intimate, and at The Barn, they are just as stunning and amazing as other weddings! Seriously, our elopements basically always break the internet. Here are 10 reasons why you might want to consider eloping. 1. You want a beautiful wedding, but without having to plan anything yourself. With elopements, we ask our couples to give us an overall color palette and theme that they love, and then we get creative and come up with a unique, beautiful masterpiece! Elopements are even less hands-on for our couples than our weddings... Which is pretty crazy, because even our most over-the-top weddings require very little effort from the bride and groom! If you want to do literally NO work in coming up with decor ideas, an elopement may be for you! You can literally show up in your dress, marry your love, take a bunch of photos, cut the cake and GO! 2. You want gorgeous wedding photos, but without everything that goes along with a big wedding. Some couples just aren't into everything that goes along with a big wedding, but it's also important to them to have stunning photos to look back on for their entire lives. This is where elopements come in! Your photos will be gorgeous, guaranteed (if you choose a professional photographer, that is!). 3. You're super romantic. There is nothing as romantic as running away to get married and then surprising all your family and friends with the big news! Morgan + Wager posted a "just eloped" photo to Facebook after their elopement to share their news... How fun is that! 4. Your family is crazy. Some of us just have totally cray-cray families who may or may not make a wedding a little (or a lot!) stressful, dramatic or awkward. Lord love 'em. Families can make weddings SUPER insane (we've seen it... eek!). If you're pretty sure your family is going to put a damper on your big day, an elopement miiiight be the way to go. 5. You want to get married, like NOW. We can plan elopements super fast. As long as we've got time to get the flowers and cake in, we've got time to plan an unforgettable elopement! We planned one of our most gorgeous (in my opinion) elopements in FOUR days. If you just can't wait any longer to tie the knot, call us up! 7. You don't like having all the attention on you. Elopements are simple and intimate, and that's perfect if one of you is super shy... It can be just the two of you (plus your officiant and photographer), or you can invite up to 25 guests. Way less overwhelming than the amount of guests at a traditional wedding! If the thought of saying your I do's and sharing your first dance in front of loads of people terrified you, consider eloping! 8. Your honeymoon is equally (or more) important to you as your wedding. Weddings are expensive. Honeymoons are expensive. If you want to have an amazing wedding, but you also want to go on the trip of a lifetime, an elopement could be your answer. Our elopement packages are inexpensive, but gorgeous... You're not sacrificing style when you elope! And you're also not spending so much that you can't afford to go on a killer honeymoon. It's a win-win situation! 9. You want to be surrounded by your closest friends and family in an intimate, low key setting. If your mom is pressuring you into inviting 80 people you don't even know, tell her you've decided to elope and are keeping the guest list under 25. She'll be thrilled. ;) Sharing your best day ever with only those closest to you is SO intimate and romantic and meaningful. It's also totally chic and trendy! 10. You want a sweet, meaningful vow renewal with your spouse. You can have an "elopement" at The Barn even if you're already married! Our elopement collection is perfect for vow renewals. That's totally my plan for in a few years, if I can get my sweet husband on board! There are sooooo many other wonderful, totally legit reasons to elope! Elopements at The Barn = No stress. Gorgeous wedding. Beautiful florals and other details. Tons of romance. Delicious cake. What could be better? You can read more about what our elopement collection includes here. Erica and Matt were married at The Barn at Twin Oaks Ranch on December 1, 2018. They chose a gorgeous color palette of red, brown, turquoise and cream. Their details were rustic… this bride LOVED windmills, rusty old things, wheat and creamer cans. It was right up our alley! We’re head over heels for Erica’s bridal gown (from David’s Bridal) with its plunging illusion neckline, stunning back and romantic lace! We also loved the unique, sheer detailing on the sides, as well as her fun red heels. This bride had the most joyful smile on her face all day, which made her the prettiest bride ever! Erica and Matt’s ceremony was stunning, thanks in part to the gorgeous 70 degree weather in December! Erica wanted something a little different; she loves rusty old things and windmills, so we used our vintage doors, an old windmill, wooden crates, two rusty creamer cans, and a few mason jars to make the perfect rustic ceremony backdrop. We added florals above the windmill and in the creamer cans and mason jars, and the pops of red were so gorgeous! Erica wanted to use turquoise in her decor as well, so we added that in with a few jade-turquoise ribbons. 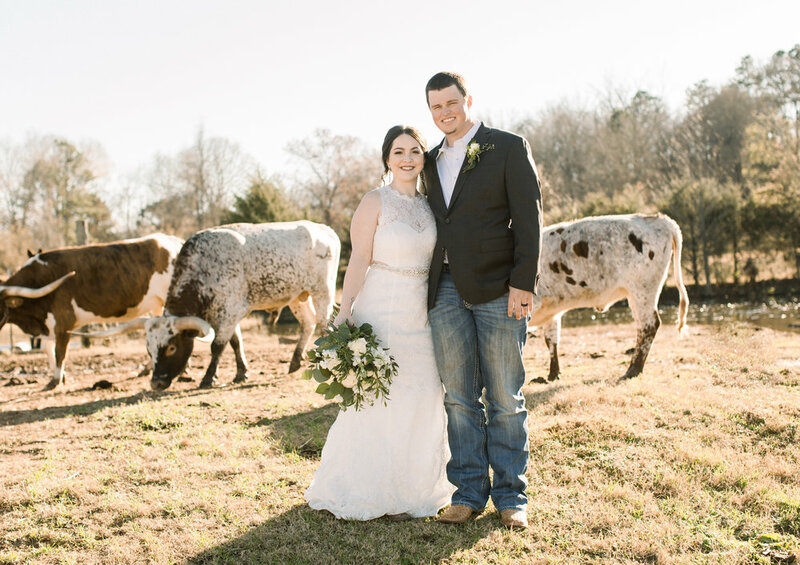 She and Matt exchanged their vows while standing on what we’ve dubbed our “Kingfisher cowhide.” ;) What can we say?! Our Kingfisher couples love it! “The windmill and touches of wheat were probably my favorite details,” Erica said. Erica and Matt’s ceremony was very intimate and sweet, with only her parents in attendance. Erica’s favorite moment of the day was “when I first got to see my husband as I was walking down the aisle,” she said. Can’t you feel the love and pure happiness in these photos?! These two are the absolute sweetest. Are y’all ready to see the most gorgeous wedding portraits of all time?! We are IN LOVE with these! Erica and Matt are so sweet together, and these photos of them in their first few minutes as husband and wife are so full of joy and love. And they’re just so PRETTY! For their cake display, we kept things rustic with an old window (with the prettiest red and white flowers) hanging over a wooden crate sitting on an old whiskey barrel. The turquoise ribbon on the floral arrangement and the drink bottle were the perfect finishing touches for this cake display. Their cake was super unique, and I’m not even gonna pretend like I know what this technique is called, but it was amazing! The best cake for a unique, rustic wedding. After their wedding, Erica and Matt spent a night in Hot Springs, Arkansas, and she said they plan to go on a honeymoon next year!